Four West Midlands police officers charged in connection with the death of a 38-year-old man in custody have had the case against them dropped. 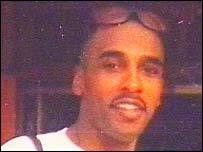 Michael Powell died at a police station after his arrest outside his mother's home in Lozells, Birmingham, in 2003. A judge at Leicester Crown Court ruled there was no evidence of neglect on the part of the officers and that not guilty verdicts should be returned. Six other officers remain on trial, but some charges have also been dropped. It is claimed officers assaulted the father-of-three, were excessive in restraining him and then failed to act when his condition deteriorated. Last month, the jury was shown CCTV footage of attempts to resuscitate Mr Powell, who suffered from mental instability. Officers were heard discussing his worsening condition and saying that they thought they were in trouble. The prosecution claimed that officers based at Birmingham's Thornhill Road police station assaulted the factory worker before colleagues restrained him excessively. It is also alleged a number of officers failed to act when his health deteriorated. Pc Lee Howard, Pc Andrew Edwards, Pc Luke Gill and Sgt David Williams were all charged with misconduct in a public office for allegedly failing to deal with Mr Powell's deteriorating condition when he was taken into custody. They denied the charges. Directing the jury to acquit the men, Deputy High Court Judge Sir Douglas Brown told them: "I will say very little about that except that it's almost entirely based on consideration of the audio tape and the various interpretations of it. "And I have ruled that the tape is in such a condition and the interpretations put in the transcript are so lacking in reliability, that you will not be troubled with them and they will be taken from you." The same charges were dropped against Pc Nigel Hackett, who still faces the allegation that he excessively restrained Mr Powell on the night in question. The judge also directed the withdrawal of one of a number of charges faced by Acting Sgt Christopher Wilson and Insp Tony Guest. Allegations that the two senior officers failed to ensure Mr Powell was taken to hospital were struck off. 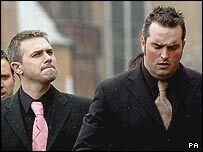 Pcs Tim Lewis and David Hadley have pleaded not guilty to dangerous driving and battery. Acting Sgt Wilson, Insp Guest, Pc Steven Hollyman and Pc Hackett have entered pleas of not guilty to charges of misconduct in a public office.